...statement dresses. Forget the statement necklace! These will definitely make you pop in a crowd. Wow 1,4,7 and 9 are my faves!Happy friday! 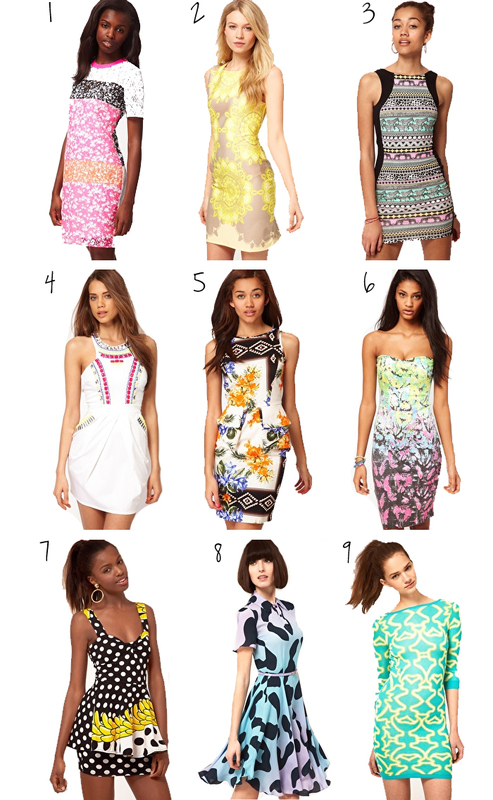 I I really like number 6 perfect for summer and the clubs! ohh #2 and #7!! nice!! and thank you so much stephanie :) i was at communication hill. there was also a couple taking engagement photos there... very popular spot :) and its awesome because you can look out over (what seems like) the whole city of san jose! I love all of these! Especially 4 & 8. Love dresses 2 and 4 so pretty! Very lust worthy. #4 & #6 can go ahead and get in my closet ASAP! love your round up! love 3,4 and 9! great selection! Fantastic dresses - I can't actually pick a favourite!